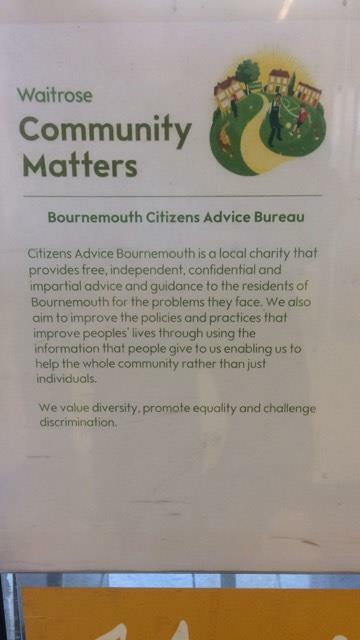 Waitrose Winton picks Citizens Advice Bournemouth…! Home/news/Waitrose Winton picks Citizens Advice Bournemouth…! Citizens Advice Bournemouth is pleased to announce that for the month of June, Waitrose Winton has chosen our charity as one of their ‘Community Matters’ charities. That means customers can chose how much out of the pot of £1000 we share between two other charities, simply by putting their green token in the box after a shop in store. People often don’t realise that we are an independent charity. We don’t have million pound marketing spend for TV advertisement; we don’t use chuggers or telephone fundraisers, and therefore become one of the forgotten ones. Citizens Advice Bournemouth is a local charity people turn to, often when in desperate need and feel they are no where else to turn. We’ve helped people get out of debt when they’ve felt the world was caving in on them. We’ve given information to people on their rights when employers or landlords have tried to take advantage. Promoting social policy change for the better and working across multiple areas such as homelessness, debt, employment, consumer rights and benefits. To view the list of areas of help we cover, see Citizens Advice ‘A to Z of advice’. Thank you Waitrose Winton and to all Waitrose customers who use their tokens to support Citizens Advice Bournemouth this June! Citizens Advice Bournemouth, the charity for your community.